Sunrise, FL – The Florida Panthers were coming off their 3rd straight win on home ice, which ties their season-long streak. That isn’t a great stat. Good teams win at home. The Panthers did anything but that on Saturday, getting embarrassed at home 7-2. Boston is close to solidifying their 2nd place finish in the Atlantic Division and are basically playing for playoff seeding positioning at this point, but they looked like the team fighting to make the playoffs, not Florida. This loss still isn’t technically the final nail in the coffin, as they aren’t mathematically eliminated from playoff contention just yet, but who are we kidding? This is more than an uphill battle. They’re mountain climbing with no rope for the rest of the season. Considering how well the Panthers have been playing as of late, their 4-2 record over Boston in the previous six games, as well as outscoring the Bruins 11-2 over the previous three home games, I fully expected Florida to pull this one off, but the guys looked out of sync and uninspired out there. There were a plethora of positive stats coming into this game that should’ve given the Cats life. I was surprised to see Aleksander Barkov and Jonathan Huberdeau absent from Saturday’s scoresheet. The duo is having the best points season in Panther’s history. It’s the first time two players reached the 80-point mark in a season. The guys are also 1st and 2nd, respectively, in scoring in the NHL since February 17th. So why can’t they win games?! Florida (#9) joins the Chicago Blackhawks (#8) as the only teams in the top 10 for goals scored this season that aren’t holding down a playoff spot. 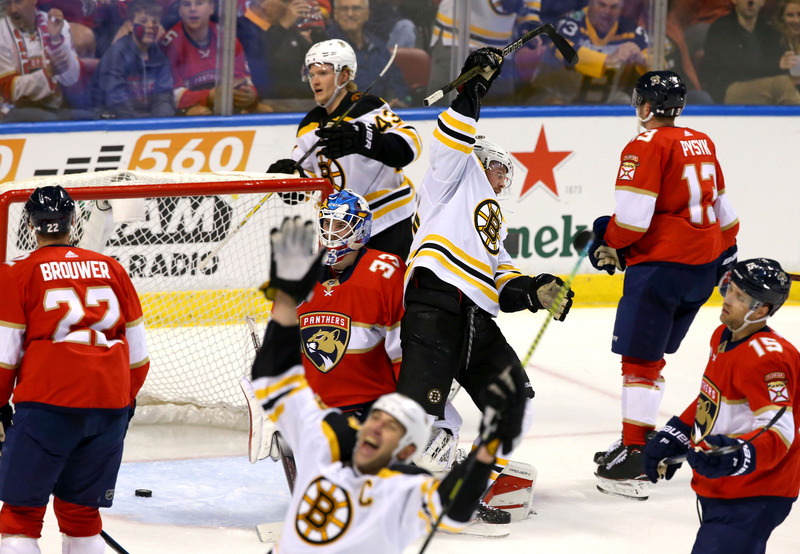 Between Saturday’s game vs. the Boston Bruins and last night’s game vs. the Toronto Maple Leafs, the Panthers scored eight goals, and lost both games! Here’s the kicker, though… They gave up seven goals in each game. According to Christopher R. Berry and Anthony Fowler of the University of Chicago, in their paper, “How Much Do Coaches Matter?“, presented at this year’s MIT Sports Analytics Conference, they describe how in the NHL, coaches matter a little bit more for goals allowed than they do for goals scored. Although they do admit to not understand why that is and defer to actual experts in the sport to analyze the data. However, the findings are what they are, and to me, that screams that Coach Bob Boughner and his staff, while building an all-time great Panthers offense, have completely dropped the ball (or puck?) on the defensive side of the ice. Here are some nuggets for you. According to NHL.com statistics, the Tampa Bay Lightning and the Calgary Flames are the only teams in the top 10 in both goals scored and goals allowed through March 25th. They’re both 1st place in the respective conferences. Arizona is the only team in the top 10 for goals allowed that is currently not in the playoff picture, but they’re only two points out. They’re also the 4th worst scoring team in the NHL. “Defense wins championships” has got to be one of the most overused sports clichés ever, but the numbers warrant it, especially in Hockey. There’s no excuse for giving up back-to-back seven-goal games, especially when you’re fighting for a playoff spot. It’s not a lack of effort. The players are fighting until the end. They scored three goals in the 3rd period, pulled Luongo late, and did all they could. Even then, they gave away the puck way too many times to take advantage of the late-game surge. The guys all agree that this has all been self-inflicted, and the numbers show it. The Panthers lead the NHL in Defensive Zone Giveaways Against, which means that, without the other team pressuring them, they literally just handover the puck to the other team in their own defensive zone more than anyone else. This is a direct reflection of what the coaching staff has failed to address. Florida is in the middle of a three-game road trip. They return home on April Fools Day to face the Washington Capitals, and hopefully, they won’t get played by Ovi, who’s probably still chugging beer from the Stanley Cup trophy. I know I would be!